Ted Hughes’s classic story, with its charismatic and mysterious central figure, the poetic intensity of its narrative, and its climactic ordeal by fire in which the Iron Man overcomes the Space-Bat-Angel-Dragon, is as strange and compelling now as it was on its appearance over 40 years ago. This new edition, a joint production by Faber and Walker, comes in a size big enough to offer scope to its illustrator, Laura Carlin, who takes full advantage with double page spreads, fold-outs and, on one occasion, holes cut through the pages, as the gruesome beast from space gets ever closer. 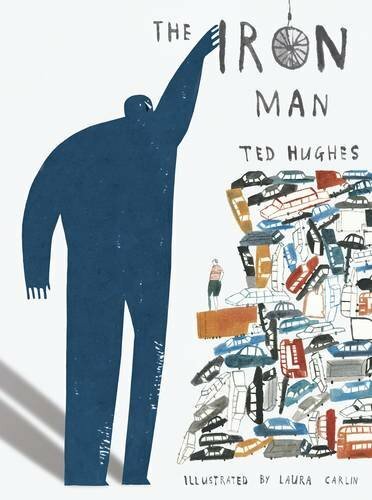 Although this may make the book more suitable as an individual gift than a library purchase, it is a magnificent production, in which Carlin’s illustrations, where the Iron Man appears either as a shadow or cut-out, as thin and substantial as a sheet of steel, both honour and interpret the text, particularly in her depiction of the tiny Lowry-like humans scattered throughout, and the detritus of their industry, on which the Iron Man feeds. With a sense of humour and history, the illustrations depict not only the mythic cosmic antagonists at the centre of the story, but also the human community whose aspirations, technological achievements, rivalries and conflicts are acted out in the central struggle. There is a certain folksiness in her tiny figures and in the machines they rely on, which reminds me of the picture books of the 40s and 50s. When the world battles the Space-Bat-Angel-Dragon, its forces include a Roman testudo and medieval siege machines, and the battle is rendered in the style of the battle paintings of Native American Plains Indians. If this was a text waiting for an illustrator to match its ambition, then, in Laura Carlin, it has found her. Congratulations, too, to the uncredited design team, whom, I assume, have put everything together.